It would be very difficult for me to pinpoint the origin of my interest in the Dragon Quest series, but for as long as been aware of role-play as a video game type, Dragon Quest has been a marquee title for the genre. In fact, before I knew Dragon Quest by name, I remember playing a game that involved guiding Mario across a map from cities to dungeons and back again, fighting monsters and leveling up along the way. I enjoyed it, but I had no idea what I was doing. When the going got tough, I died. This game turned out to be Super Mario Remix 2, a weird hacked version Dragon Warrior I. This is not exactly a story book origin. Quite a bit has changed in RPG landscape since then. I’m referring, specifically, to the time period after Dragon Warrior came out in 1989 (not that I've ever actually played the original), but I suppose it wouldn’t be untrue to say that things have changed since Omniverse Software released the first version of the hack in 1999. The Dragon Quest series is often assumed to be mired in decades-old RPG conventions. I find this assertion to be somewhat reductive. 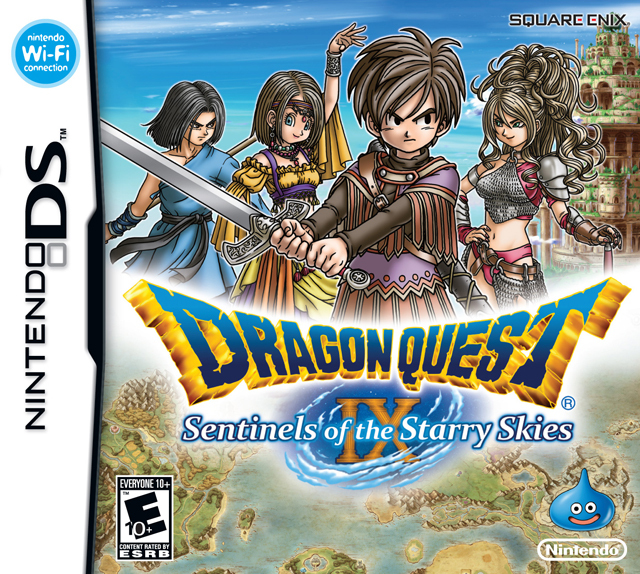 While each of games that I’ve played in the series bear certain commonalities, each of them has a unique charm, and Dragon Quest IX: Sentinels of the Starry Skies is arguably the most forward-thinking of them all. The first noticeable departure from tradition is character creation. The very first thing that you do in Dragon Quest IX is to define the look of the protagonist by choosing parts from an array of cutesy Akira Toriyama-designed physical attributes. Shortly thereafter, your protagonist is dropped right into the story. Dragon Quest IX’s story kicks off with the protagonist, who is an angelic Celestrian, working to collect the thankfulness and goodwill of mortals: a sort of heavenly resource referred to as benevolessence. Something goes wrong, the Observatory is decimated by an unknown evil, and you wake up (sans-wings) back down in the mortal realm. Adventure ensues. The series-standard battle system is present for Dragon Quest IX in all of its simple complexity. Battles consist of your party members taking menu-driven turns, trading blows until the baddies fall. The major difference here is that all of the enemies can be seen walking around the environment, which makes it possible to choose your battles. However, just because it’s possible to avoid a fight doesn’t mean that it’s advisable to avoid them all. Fighting yields levels, and every few levels yield skill points, which you can apply to the skill of your choice. All of this works to make your party members stronger, and great strength tends to a be a requisite part of defeating ultimate evil. As if tailoring your skills didn’t allow for enough variation, Dragon Quest IX is the first in the series to feature a class system. As you build your party members (the exact same way you created your main character), you also choose their vocation. As you would expect, each vocation comes with its own strengths and weaknesses, which makes it important to build a balanced party. Just as the main quest opens itself up, you meet a holy man at Alltrades Abbey named Jack (get it? Jack of Alltrades) who can change your party members’ vocations, carrying over some vocation-specific skills. After that both your party and the story is at your control to approach as you see fit. It may not be nearly as open-ended as Dragon Age or Fallout 3, but the experience is considerably more customizable than any Japanese RPG that I’ve ever played. As you are battling your way through the main quest you are likely to come across some unique characters that ask you to do things that are completely unrelated to said main quest. This is indicative of yet another addition to the formula for Dragon Quest IX. Some NPCs will provide you with quests with rewards that range from alchemy ingredients (yes, this game has alchemy) to weapons and skills to powerful vocations. It’s all optional, but helps to add to the variety that this game provide. Also adding to this variety is the treasure map system. At some point during the main quest of Dragon Quest IX, you might come across a treasure map or two. Each of these maps will open up a randomly generated dungeon, which in turn will yield a map to a more difficult randomly generated dungeon upon completion. There are a theoretically infinite number of possible dungeons, many of which contain enemies that are far more difficult than anything you will encounter in the main quest. These too are completely optional, but the enterprising adventurer will be rewarded for completing some of the more difficult dungeons with the best gear. If you manage to survive a tough encounter in the depths of a random dungeon, you’ll want to head back to The Quester’s Rest for a good night’s sleep. This inn serves as your headquarters throughout the game, and is definitely a place worth visiting. From here you can download new quests, special guests from previous Dragon Quest games, and daily merchandise updates for the DQVC Shopping service. Furthermore, you can put your game into tag mode, which will open up your Nintendo DS’s Wi-Fi connection to other people who are in tag mode. Their main characters will visit the inn, potentially bringing a valuable treasure map with them. This is a novel feature, to be sure, but it’s rendered nearly useless in the United States by a lack of both mainstream buy-in and population density. However, if you are lucky enough to find another human being with an affinity for slime bashing, you can invite them into your game from the lobby of The Quester’s Rest. This feature allows anyone who is playing within Wi-Fi range to jump into your game and help you out with anything from main quest bosses to tough treasure map dungeons. Even when you think you’ve completed the game, you’ll quickly find that you’ve only scratched the surface of what it offers. There is so much to do in Dragon Quest IX that it possesses an almost boundless playability, and thanks to a surprising level of polish relative to other Nintendo DS titles, it’s always easy to come back to again and again and again et infinitum. 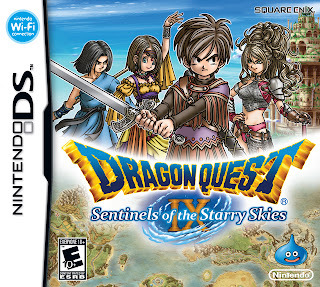 It's certainly been enough to inspire me to repeatedly pry open my Nintendo DS's powder-blue clamshell to feverishly pursue higher levels and better gear, making Dragon Quest IX a strong contender for my favorite Nintendo DS game ever.